A simple gesture, like giving flowers, means a lot to birth mothers on Mother’s Day. Birthdays and Mother’s Day are often the two toughest times for a birth mother. However, when their child’s adoptive family shows them appreciation, it eases birth mothers through those tough times. You can choose to honor your child’s birth mother on Mother’s Day, which is Sunday, May 8th, or Birth Mother’s Day, which is Saturday, May 7th. Whichever day you choose, making a gesture of appreciation towards your child’s birth mother will go a long way. Especially if you are in an open adoption, reaching out to the birth mother and keeping the lines of communication open are important. Here are a few ideas for celebrating the important role your child’s birth mother has in your family. Send photos. Even if you already send your child’s birth mother photos, sending special Mother’s Day photos is a nice gesture. Many birth mothers agree that they can never have too many photos of their child. You can choose to make a collage, include a special frame, or create a scrapbook. Something your child made. 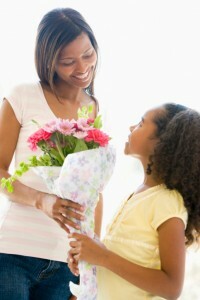 Having your child make something to give their birth mother is a great way to encourage a positive relationship. Your child also benefits by feeling involved and important. Your child can make a card, write a letter, construct a picture frame (include a picture! ), or create a drawing. If your child is a baby or toddler, you can make a craft project that incorporates handprints or footprints. Pamper your child’s birth mother. Many mothers spend Mother’s Day being pampered by their families. If you include your child’s birth mother in your family, then you may want to help her feel pampered! You can send her a gift certificate to a spa or nail salon. Alternatively, you can create a spa basket with handpicked items like soaps, mud masks, candles, bubble bath, etc. Send flowers and a card. Flowers and a card is always a sweet gesture. You can also arrange for your child and their birth mother to have a special Mother’s Day phone call if you’d like. Big gesture or small gesture, your child’s birth mother will appreciate being included on this special day. This entry was posted on Wednesday, May 4th, 2016	at 10:54 am	. You can follow any responses to this entry through the RSS 2.0	feed. Both comments and pings are currently closed.